Big speakers sound better. They have more and better bass, more capacity for playing loud, and – surprising to some – they sound better even at lower volume. Why is that, and is it possible to achieve much of the same in a small speaker? Big and powerful sound – punch, tactile – we feel the sound on the body, explosive transients – drums like at a concert, realism, sound level similar to a live concert when we want it. And when we turn down the volume, much of this sound character with realism and instruments with body is still present. This is about capacity, sound field and radiation pattern. Size of the sound source relative to wavelength. A big speaker is better simply because it is big. Proper bass requires size, that is something most audiophile enthusiasts have experienced. Small, compact speakers which on paper promises extreme subsonic bass does not work in real life. But the most important differences are in the range from upper bass and in to the midrange, where instruments get body and realism. Actually, one can do with quite small subwoofers for the deep bass if the midrange is reproduced with sufficient cone area. Technically, it is intensity of the sound field and radiation control that improves when the speaker is large. Intensity affects how powerful the sound is experienced for a given sound pressure level, while radiation affects clarity, both influences realism and body for instruments and sounds. 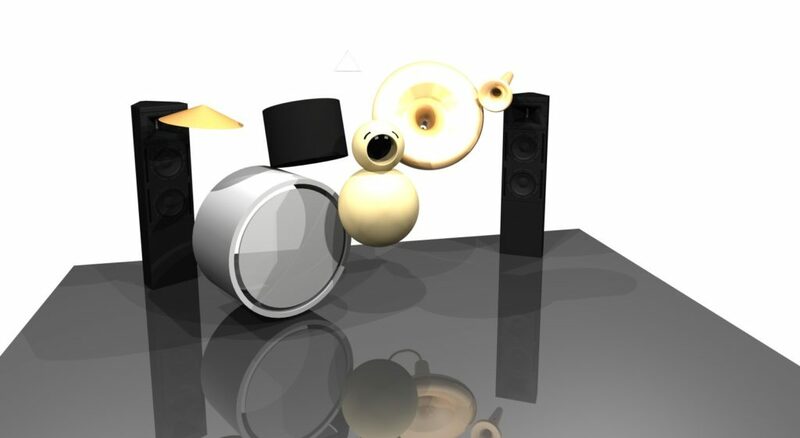 With a large horn speaker it is possible to achieve very good clarity and simultaneously room contribution to give life and size to the sound. Controlled and limited radiation gives very short decay for early reflections – that increases clarity, while more sound energy is sent towards the back of the room, giving energy to late reflections – more space and life. Big panel speakers have much of the same. Capacity – how loud a speaker can play – has more significance than many are aware of. Even at modest sound levels a typical small hifi-speaker will start to compress transients in the lower midrange. Small speakers that can reproduce bass gets poor capacity, this is a physical limitation. So that even if capacity alone does not necessarily correlate to size, it is not possible to make a small speaker with both deep bass and good capacity. Big speakers are also fun aesthetically – it is impressing with something big and dominant, giving the sense of solidity and power, even with no sound. Never the less it is attractive with something more elegant, taking up less space, more discreet. Easier to accommodate tastefully into a home environment where the sound system is visible, but not dominating. For many people large speakers are simply not an option because they take up too much space and are too dominant. Large speakers is also more expensive simply because they are large – expensive to ship, cost more to build. It is not difficult to find small speakers in the shop, actually most of them are small. If only the sound was good, too. Much of this is possible to get in a small speaker. It will not be full-scale sound, but if we lower the volume just a bit, it can get quite good. Short listening distance, small room, also helps. Such a speaker will be a little different from the usual simple, square box. With separate bass-system there will be more speakers, but also better flexibility for placement. And this solves the problem with radiation control at low frequencies, where this is difficult to achieve. Physical appearance will be determined inside limits dictated by chosen technical solution for radiation control. Capacity and transient reproduction is much easier to achieve when the small speaker does not need to play bass. 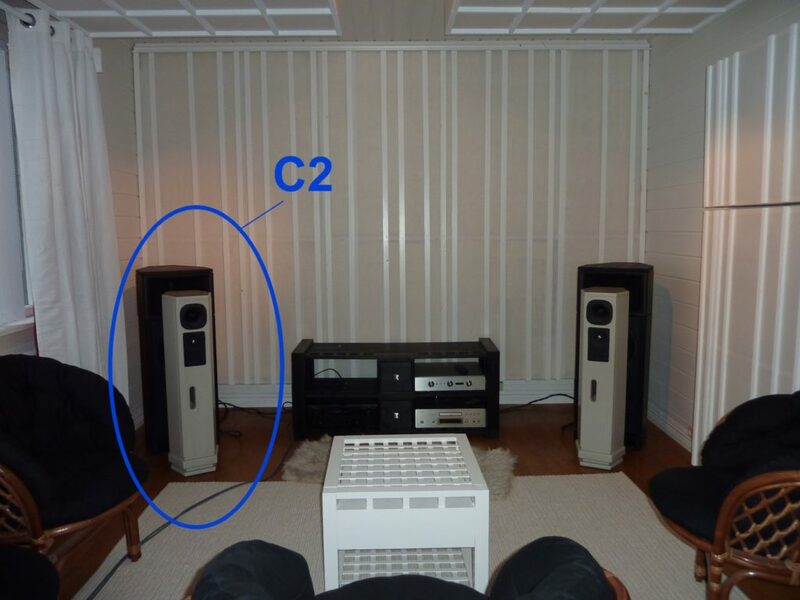 The C2 loudspeaker from the 90ies is an example of a small speaker. A 14cm driver covers the midrange and down to 150hz, the lower part of the cabinet is sort of a subwoofer with two 17cm drivers inside. If this lower section is removed – because the bass is handled better by an external bass-system – then this will be a small speaker. Unfortunately some quite essential sound properties are missing to achive this enganging and alive sound, it sounds nice and smooth, but lacks kick in transients and power down the lower midrange. Radiation is wide. This is due to choice of drivers – this midrange has wrong type of motor system to achive good transient reproduction. This is not a design error, it is the result of choices made according to the desired sound character that this loudspeaker is supposed to have. 90% of all speakers in a shop is made according to this sound ideal. The F1 is something very different. Here you have punch and life, all the way down to around 60Hz where it rolls off. Capacity is sufficient for full-scale sound in a small room. Radiation is quite wide at lower frequencies, the high frequency horn gives controlled and precise radiation in upper midrange and treble. But this speaker is not that small. F1 is a little too big for a true small speaker. F2 has a different sound character, and the larger horn gives better pattern control further down in frequency. Here you get a precise three-dimensional sound landscape with realistic proportions, and practically unlimited capacity, it never sounds pressed no matter how loud. 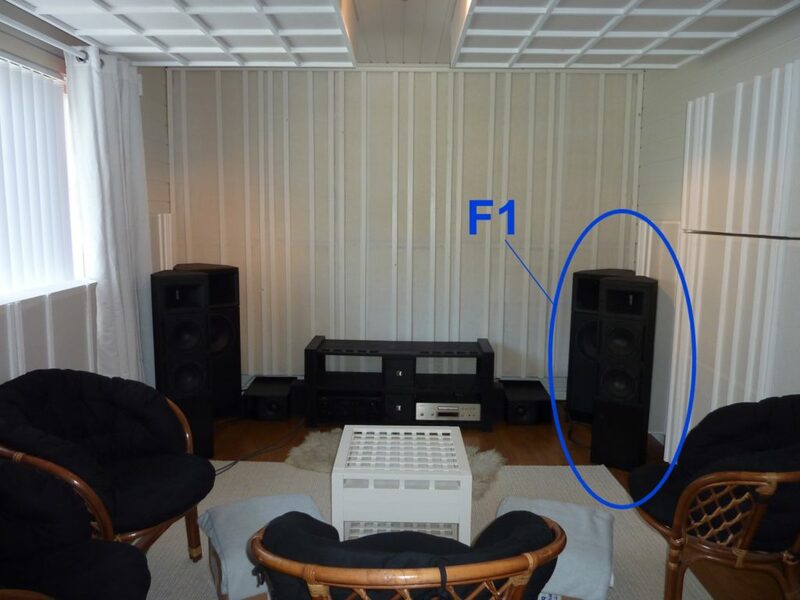 But F2 is definitely not a small speaker. F2 can easily be quite dominating in a small room. V6 is a very small Compact Horn subwoofer. Two of those makes a very suitable bass-system for the small speaker. They occupy little space and are flexible for placement. V6 subwoofers gives real bass in small format. Then we need a small speaker that can play from around 120hz and up. 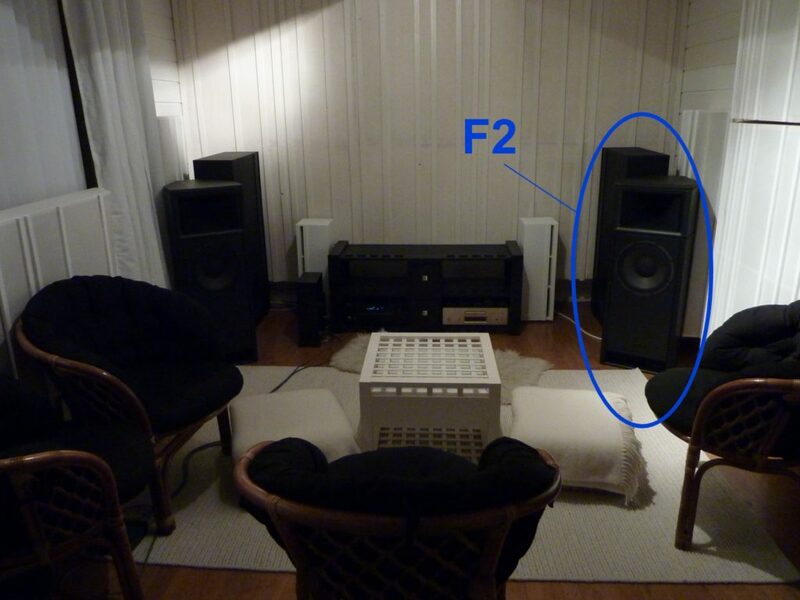 Which sound like the F2, but can not play very loud. This small speaker will cost more than most people want to spend on sound, and it is accompanied by a story about compromises; can not play loud. A small speaker with decent speccs that can play from 120hz can be had for approximately the cost of filling up a car with gas. You can get a speaker with smooth frequency response and smooth radiation pattern, it can not play loud, but that was part of the idea here – it does not need to play loud. This can be bought in any store, directly from the shelf, simple and quick. Om paper it can be hard to see what can possible be so much better. Everyone can hear that the sound is different, but what does this mean and what is the added value when you listen to music or watch a documentary. Often it is so, that only after loosing something you took for granted, you notice something is missing. Like when you have good and engaging sound at home, and visit someone, you immediately notice that something essential is missing. Then you realize that sound quality is crucial for the experience. This is about much more than just some improved clarity and intelligibility on dialog in movies, or some more details from the favorite music.